I'm not too much of a shopper, but a born browser... oh yes. An Anthropologie store is one of those places where it's possible to lose all sense of time and still not see everything that's been artfully arranged by an ingenious visual design team. 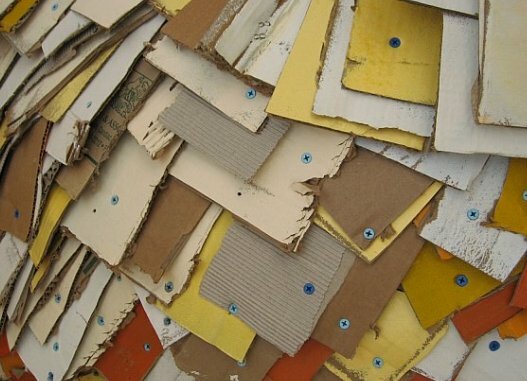 Known for fantastical window and interior displays, I bet you won't be surprised to learn paper is often the medium of choice. Reclaimed materials are frequently incorporated and work of local artists is sometimes featured. 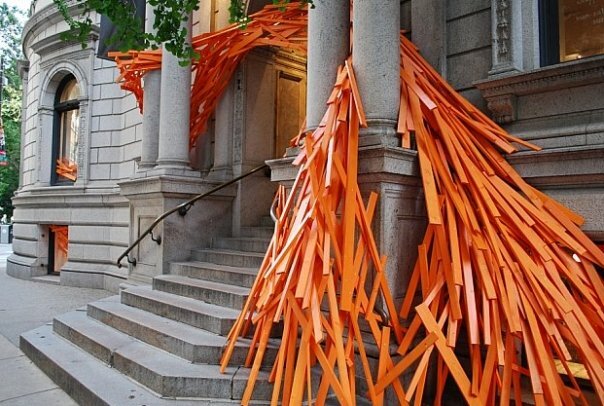 The theme for this autumn is the beauty of movement; cardboard, lumber, and fallen branches are utilized en masse to contrast with a store’s architecture. If you aren't familiar with Anthropologie, they sell an enticing mix of women's fashion, home decor, decorative antiques, and found objects within a setting that feels like a collection of independent boutiques. 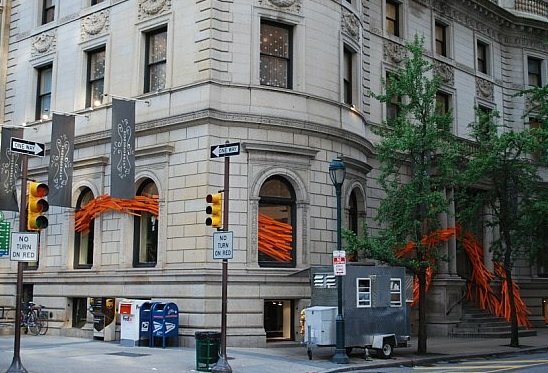 ...it's a beautiful, old mansion on Rittenhouse Square. But this doesn't keep me from being curious about stores in other cities across the country (and soon in London), as I think it's safe to say no two are exactly the same. Anthropologie's Facebook page is where I found the above photos - it's a great place to check out the latest. On the other hand, I came across the following pictures via Papermode. 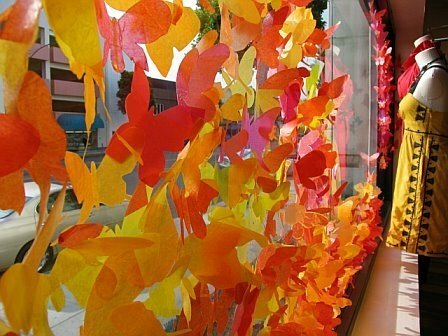 Camille Asseraf, the site's owner, had snapped window displays at the Princeton, New Jersey Anthropologie store for her blog because she was so intrigued by these rolled book sculptures that resemble flowers. 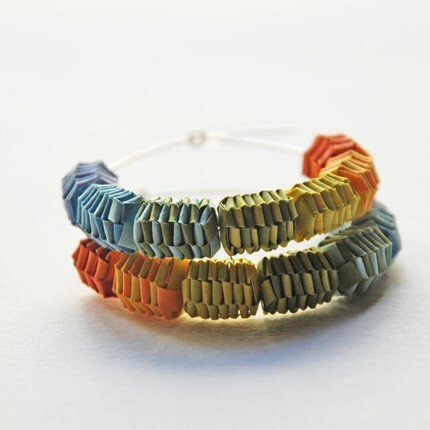 I kept reading and quickly realized I was already familiar with Papermode's jewelry creations and even follow her on Twitter - small world! She sells these eye-catching earrings and necklaces in her Papermode Etsy shop. I love her fresh, modern take on an old quilling technique. 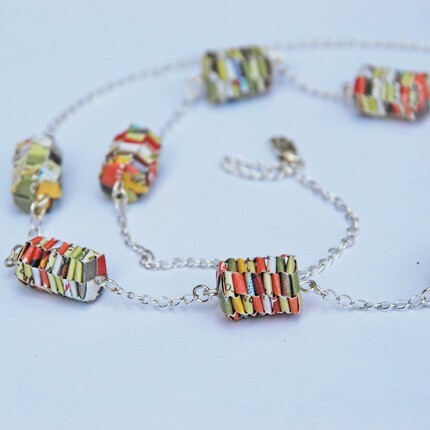 The barrel beads are made from recycled paper - such a pretty choice of colors - and the hoops and chain are sterling silver. I think what's especially fascinating about Camille's designs is that they accentuate the delicate nature of paper, as well as its strength. Perhaps you remember my recent post about Jason Thompson of Rag and Bone Bindery. The beautiful renovation of the company's old mill building as his family's second floor living space has been featured on Apartment Therapy. Be on the lookout for his paper magic displayed throughout the home. Hi Duck! Wonderful, Fabulous blog! Guess what, I finally got my papers out and am faffing. Not made anything yet, but the ideas are pouring out! Miss you lots. Hope the family is fine. Your posts are always a visual and creative delight! My dad is 83 and a lawyer. I will inherit his wall size collection of out-of-date law books that he cannot part with (they do look very artfully libraryesque, but I don't have room in my house for that size of sentimental "wall"). Because of my love of books and the sentiment thing, I was hating to have to eventually dispose of them. Now I have lots of ideas of what can be done with them after seeing these examples of reclaimed art!!!!! And, when transformed, I will have a more managable sized remembrance, plus lots to share! Thanks for sharing!! 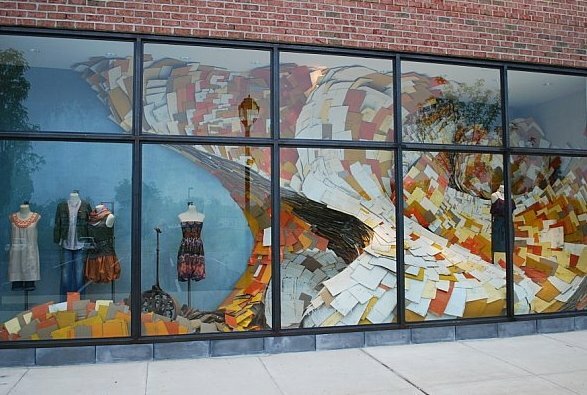 I also love to look at Anthropologie windows and displays whenever I am visiting a different city! So incredibly imaginative and resourceful!